Before getting to Ocna de Fier (German: Eisenstein, Hungarian: Vaskő) one passes by the famous miner of Tibor of Bottik on the DN58B and reaches the monastery of Saint Elias in Vasiova, a part of Bokschan. The convent, which is dedicated to Elias, saint of thunder, is a branch of the famous Agapia Monastery in the eastern Carpathians, and is said to be a place of wonders for people with eye diseases. Legend has it that at the beginning of the 20th century, a blind miner had washed his eyes in a source across from the monastery’s main entrance and was able to see again. Today, a chapel is built around the source. 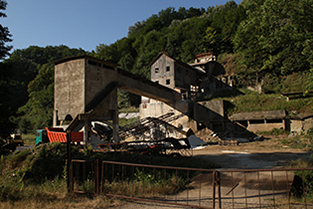 On the way from the convent to Ocna de Fier, which used to be the second larges location for copper, iron, metal and precious metal in the mining area of Banat, one passes deteriorated industrial sites and is welcomed by buildings that clearly show the industrial heritage of the place. From here, the ores used to be transported to Bocșa on a ropeway. Until today, one can see the equipment for loading the ores and for transporting the lorries to Bocșa , where the iron was prepared in the furnaces of Reșița and metals and ores were broken down. Upon passing those buildings, the first houses of the old mining settlement Ocna de Fier can be seen, with their typical architecture that could be found in the whole area of the Banat mountains. The houses had extended basements to spend the hot summers in and upper floors to stay in during the winter. In the cold months, the basement would have been used as a storage room. 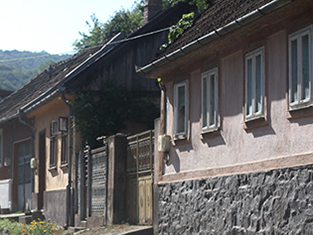 The alinement of the houses in Ocna de Fier is reminiscent of Banat’s defensive architecture, as it can be found in the regions close to the Danube. Their architectonic style can easily be recognised and the houses have become increasingly popular with wealthy people from Banat, who buy whole areas of such houses in order to restore them – more or less authentically – and use them as weekend houses. Ocna de Fier is the home of a treasury: a private mineral museum belonging to the 91 year-old Constantin Cruescu, a former mining technician. In his exhibition room, which is only a couple of square metres big, one can see the 250 minerals of the Banat Ore Mountains which have already been classified. 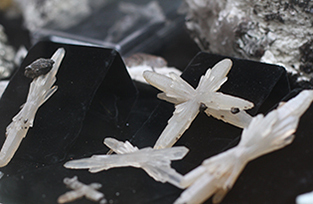 Among them are spectacular crystal formation, but also more humble looking minerals, which are quite rare and have been found here for the first time (e.g. Ludqigit, Dogneceait, Warthait, Goetheit, and others). In 1971, Constantin Gruescu described a unique specimen: the coaxial twin with radial excrescents, a crystal formation formerly unknown. The hot summers were spent in the extended basement, the winters on the upper floor.